Other names: Lions-tooth, Blow-ball, Cankerwort. Authorities disagree as to whether dandelion is native to Eurasia or North America. It is found throughout most of the United States. Common dandelion is a perennial broadleaf with a thick fleshy taproot. It spreads by seeds and by new shoots from roots or root segments. It flowers from early spring to late fall. Seedlings may occur throughout the spring and summer and are often abundant in the fall. Common dandelion is the most common broadleaf weed in lawns, golf courses, athletic fields and other turfgrass areas. It is found in virtually every kind of habitat, from openings in deep woods to cultivated fields, from rocky hillsides to fertile gardens and lawns. 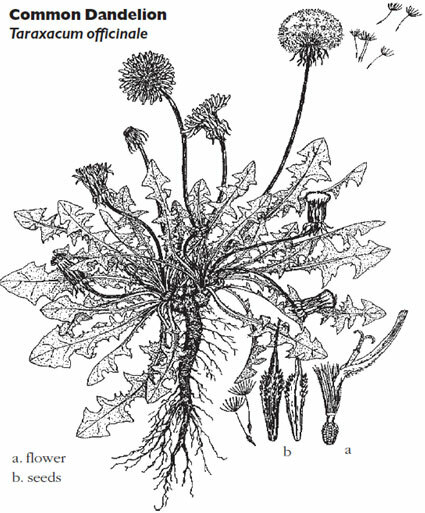 Common dandelion has a thick fleshy taproot with many-branched crowns, with milky juice. The stem is very short and wholly underground, producing a rosette of leaves at the ground surface. Leaves are simple, 3 to 10 inches long, containing a milky juice. Leaves vary in shape, from lobeless or entire to having deep-cut lobes. Flower-heads are golden-yellow, 1 to 2 inches in diameter, with yellow ray flowers, borne on a long, hollow stalk. Seeds are yellowish-brown, 5 to 8 ribbed on each side with minute curved spines on the rib margins of the upper half of the seed. Seeds are tannish, about 3/16-inch long, elongated, with a slender tip bearing a tuft of hairs that are easily broken off. Common dandelion is distinguished from other plants by the presence of milky juice, lobed or divided leaves in the rosette stage, the soft texture and irregular lobing of leaves, the absence of prickles on margins or midribs, the smooth or softly hairy leaf surfaces, and a deeply penetrating taproot. Flowering plants are distinguished by their large yellow flower heads borne singly on long, unbranched, leafless, hollow stalks that arise from among the rosette leaves. Common dandelion can also be distinguished from fall dandelion (Leontodon autumnalis) which has branched flowering stalks. Fall dandelion is also common to Massachusetts lawns. Maintaining a dense, healthy, vigorous lawn is the best method of managing many turf weeds. As such, the use of adapted species of grass, adequate fertilization, proper mowing and irrigation practices, and appropriate insect and disease management all help to minimize dandelion occurence. Low nitrogen fertility may result in high populations due to less competition from desirable turfgrass species. Mowing the turfgrass area as soon as the first dandelion flower-heads appear can help to reduce further infestations. In small areas, dandelion plants can be managed by hand, provided that the taproot is removed. Dandelion can be managed by specific herbicides for broadleaf weeds which are labeled for dandelion control. Early fall may be the best time to treat dandelions, however herbicides will be effective when applied in spring or fall providing that dandelions are actively growing. The lawn should not be mowed for two or three days before and after herbicide application. The treatment application should be done at a time when there is no rainfall forecast for at least 24 hours. For a details on current herbicides registered for dandelion control, refer to the latest edition of the Professional Guide for IPM in Turf for Massachusetts .